Smooth Repair Vegan Shampoo: The first thing I noticed about this shampoo (apart from the pretty packaging) was the scent - it's like mandarin oranges but in a subtle, natural way. This shampoo is sulphate-free, which is brilliant for coloured hair, in particular, as it won't strip colour and it is formulated with Omegas 3,6 & 9 as well as Vitamin C, Pro-Vitamin B and Amino Acids. It lathers well, rinses easily and a little goes a long way. The result is hair that feels really clean but not stripped. Smooth Repair Vegan Conditioner: Enriched with the same omegas and vitamins as the shampoo as well as quinoa (repairs damage) and horsetail (contains silica to improve the elasticity of the hair), this conditioner is rich enough to nourish and strengthen the hair, yet it isn't at all heavy. I tend to leave this in my hair for around 5/6 minutes while I wash and exfoliate my body, before rinsing, which results in soft and nourished hair. It doesn't weigh the hair down and isn't difficult to rinse out so it's a winner for me. Multi-Vitamin Nourishing Spray: Formulated with Omegas 3,6 and 9 and Vitamins A, C and E, Amino Acids, Baobab, Quinoa, Macadamia Oil and Almond Oil among others, this spray has 25 listed benefits. From heat protection, to detangling, colour protection to frizz elimination and taming fly aways to increased elasticity - this spray does it all. I have knotty hair so I have to use a detangling spray after I wash my hair to protect it when I'm coming and I love using this spray as it helps my brush to glide through my hair but it's lightweight so it doesn't feel like I have any product in my hair. Seaberry Dry Oil: Enriched with four oils (Jojoba, almond, argan and olive) as well as Seaberry, this lightweight oil adds extra shine to my hair as a finishing touch. It also tames any frizz or split ends that appear when my hair needs a trim. It's also good to use to refresh second day hair. It doesn't weigh the hair down at all and I also like to use a bit on my body because it's nourishing but non-greasy because it's a dry oil, so it would be a great product to bring on holiday as it's multi-use! Overall, I am loving this range. Just last week when I was with my hairdresser, she commented while drying my hair, that my hair felt so strong and was drying so smoothly and she asked what I was using in it so the results are not just in my head if even my hairdresser noticed! 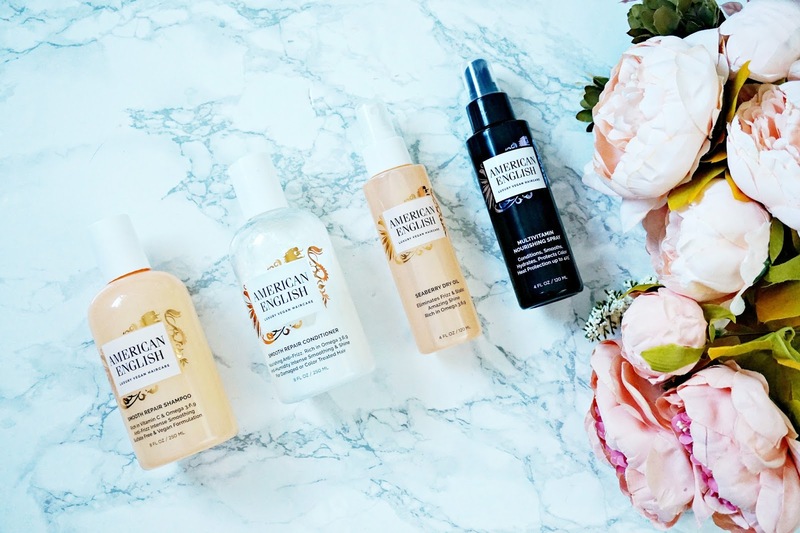 Have you tried any American English products yet? I'd love to hear your thoughts. The range is available from ASOS. All products are bought by me, unless otherwise stated. All of these products were kindly sent to me. Opinion is always my own.